Whatever packaging you use, sometimes there’s a space to fill. The ECOPAC range of loose fill packaging products solves your problem. Wherever possible we encourage our customers to choose the bio-degradable, starch based Ecoflo. Like a big packet of kids snacks* without the flavouring, Ecoflo completely disappears in time (or in a glass of water if you want to try it out!). If Ecoflo isn’t for you then we also stock Pelaspan, a polystyrene based shaped piece designed to interlock to prevent ‘settle’ once a pack is sealed. 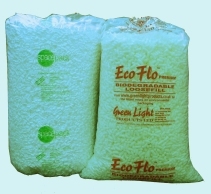 Ecoflo and Pelaspan Spacepack is sold in 15 cu ft. bags. We also stock a range of tissue papers and newsprint off-cuts that can be scrunched up to fill space in boxes before sealing. Take a look at our cushioning materials and foam products for other ideas that will ensure your product isn’t rattling around in transit, before it arrives at your customers.